Your garbage disposal can be finicky, so don’t expect it to devour and digest everything. For example, don’t throw corncobs, artichokes, avocado pits, or fish and chicken bones down a disposal and expect it to continue working without a clog. Flip through the owner’s manual to find out what your disposal’s limitations are. Never use chemical drain cleaners in a disposal. The chemicals are highly corrosive and may damage rubber or plastic parts. Use Mother Nature’s deodorizer for your disposal: Every few months, cut a lemon in half, throw one half in the disposal, turn on the unit, and let it run for a minute or two. The lemon removes the build-up of residue on the interior of the disposal and deodorizes the unit. You know it’s working by the fresh lemony smell. Shut off the electrical power switch. This switch is located under the cabinet, near the disposal, or on a wall nearby. If you don’t find a switch, go to the main power panel and turn off the breaker or remove the fuse that powers the disposal. Never put your hand in the disposal. Remember that the switch may be defective, so keep your hands out of the disposal even when power to the machine is turned off. Take a look in the disposal. A flashlight may shed some light on the problem — you may see a large object caught in the disposal. If an object caused the stoppage, use a pair of pliers to reach into the disposal and remove it. Wait 15 minutes for the disposal motor to cool. Turn on the power and push the reset or overload protector button. This button is located on the bottom of the disposal. 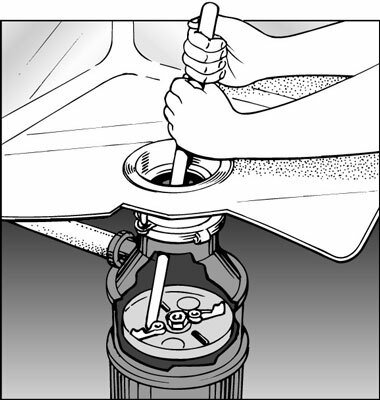 Turn off the power and insert a long dowel, a wooden spoon, or a broom handle — never your hand — into the drain opening. Push the bottom end of the wooden probe against the impeller (the blades that grind up the garbage) and rock it back and forth to free it. When the impeller moves freely, wait 15 minutes for the motor to cool, turn on the power, and push the reset button. Some disposal models come with a large L-shaped hex wrench. If you have such a model, turn off the power, insert the hex wrench into the opening in the center of the disposal’s bottom, and turn the wrench back and forth until the impeller is freed. Again, wait until the motor has cooled, press the reset button, and then try operating the disposal.